JaRule is in the process of filming GOAT, a crime movie to be released in 2011 with the tagline "Wrong Turn. Wrong Choice. Wrong Guy." This movie is currently in post-production status and will also employ a cast of actors such as Ice-T, Elia Monte Brown, Vincent Pastore of the Sopranos and others. Below are some pictures of JaRule and Elia Monte Brown. 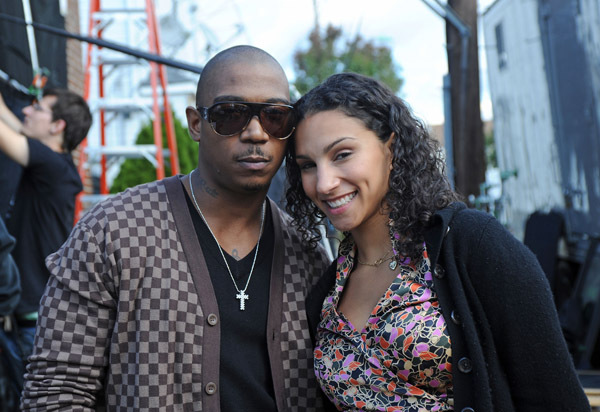 JaRule is wearing a Louis Vuitton Brown Damier Cardigan on top of a black v-neck t-shirt, which I would say he is wearing very well. Score for Ja. For purchase information contact Notable Styles and More, the personal shopping division at this link. It also looks like JaRule is wearing Louis Vuitton shades as well!! !